Hatch & Co introduced SKINNY, a new Bluetooth Keyboard Case for Apple's iPad 2 tablet. 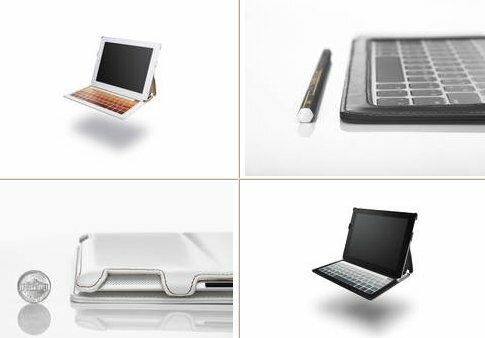 Start-up company Hatch & Co., is presenting their first product today with the, "SKINNY": a stylish faux leather iPad 2 case that also integrates the world's slimmest and lightest wireless keyboard. Unlike other iPad keyboards that use thick chiclet keys, the SKINNY wireless keyboard breaks the mold with its unique use of touch technology. This enables the SKINNY keyboard to be ultra thin, measuring only 0.07 inches. Plus, this makes the SKINNY keyboard spill-proof. All these design features make this Apple accessory a perfect gift idea for the coming holiday season. “Pushing the innovation envelope is what we're all about at Hatch & Co. and we are excited to see how others in the Apple and gadget communities will respond to what we have accomplished with the SKINNY iPad 2 Keyboard Case,” said Kenny Chen, General Manager of Hatch & Co. Whether iPad users are at their home, office, or somewhere in between, the SKINNY's look, feel, and unmatched features are sure to turn heads and inspire creativity. Incredibly Light & Thin: Only 0.6 inches thin and weighing only 10.4 ounces means this iPad 2 Keyboard Case is unparalleled among other Apple accessories. Cutting Edge: Unlike other iPad keyboards that use chiclet keys, the SKINNY's QWERTY keyboard uses ultra-thin touch technology, developed originally for mobile phones, making it incredibly responsive. Furthermore, the keyboard keys have a special texture to enhance their feel and usability. Tough: Unlike the competition, the SKINNY's keyboard is spill-proof and dust-proof, making it a fantastic choice for users who regularly find themselves at coffee shops and restaurants. Wireless: Bluetooth capabilities allow the SKINNY to pair with any iPad as well as iPhones. Power Saving: Special sensor automatically wakes up the iPad when the case is opened and puts it to sleep when the case is closed. Long Battery Life: The high-quality battery lasts for sixty-eight hours of continuous use. The included USB battery charger returns keyboard power to full in about two hours. Convenience: Multimedia hotkeys allow easy navigation home, as well as to control volume, music, and input language. Additionally, four small LED lights indicate low battery, currently charging, caps/symbol lock, and currently connected. Sophisticated Casing: Side grips secure the iPad with protection for each corner while leaving space along the edges to expose the iPad's built-in speakers, ports, and power switch. Additionally, a small cut out in the backing exposes the iPad's camera for easy use. Stylish Coloring: Black with gray accenting or white with brown accenting. In the black version, the keyboard's color goes from light gray to dark gray and in the white version from light brown to dark brown. The SKINNY is designed for entrepreneurs and professionals who are always on the go and require trendy aesthetic protection for their iPad 2, as well as the convenience of a responsive and accurate keyboard. Perfect for taking notes during meetings, recording ideas during creative coffee breaks, and efficient social messaging, the SKINNY iPad 2 wireless keyboard case's super light design enables users to get all of the advantages of having protection for their iPad 2, plus a keyboard, with almost no additional weight or bulk. “Cutting edge, functional, and sophisticated is what we were going for when we designed the SKINNY and we are energized through our success,” said Mao Wang, Creative Director of Hatch & Co. The SKINNY is already available at: Amazon.com.